Taiwan has lifted sanctions imposed on the Philippines after Manila issued a formal apology to the family of a Taiwanese fisherman shot dead in disputed waters. Taiwan's foreign minister announced the relaxing of all 11 measures, including a freeze on hiring Filipino workers. The Philippine coast guard shot fisherman Hung Shih-cheng on 9 May. On Wednesday Manila recommended homicide charges against eight coast guards who admitted firing weapons. "The government of the Republic of China [Taiwan] announces that the sanction against the Philippines is removed immediately after the Filipino side has displayed apology and goodwill in written statements and action," AFP news agency quoted Taiwan's foreign ministry as saying on Thursday. Mr Hung, 65, was shot in waters which both sides say lie within their 200-nautical-mile from shore exclusive economic zone. The Philippines initially said the shooting - which sparked a serious diplomatic row - was an act of self-defence, but has now concluded that its coast guard officers used excessive force. The Philippine president sent special envoy Amadeo Perez to visit the fisherman's family in southern Taiwan on Thursday. "I have been authorised by President Benigno Simeon C Aquino III to personally convey the president and the Filipino people's deep regret and apology to the family of Mr Hung Shih-cheng over the unfortunate loss of life of their beloved one," said Mr Perez. The family has accepted the apology and reached an agreement with Manila on compensation for their loss. 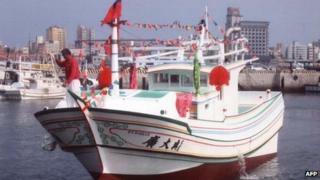 The two sides have begun fishing talks in which they both agreed to not use force in dealing with each other's fishermen, reports the BBC's Cindy Sui from Taipei. They also agreed to inform each other about the arrests of the other's fishermen and to set up a system for handling detentions and release of fishing crews. Taiwan was angered by what it considered to be a slow and insincere response from the Philippines, our correspondent adds. Its hiring freeze had prevented around 10,000 Filipino migrant workers from obtaining work permits. Taiwan's government on Thursday said it hoped to restore good relations with the Philippines. But it asked Manila to prosecute the responsible officers in a timely manner and schedule a next round of talks on fishing rights to prevent similar incidents from happening again, our correspondent says.